Earlier this year, I had a front row seat at a lecture given by Sandor Katz, author of two authoritative books on wild fermentation, which is salt-fermenting vegetables using the microbes nature provides on plant tissues. For an hour, Katz shared tips and massaged sea salt into a big bowl of chopped cabbage and radishes, crunching the mixture with his hands. Though I have been fermenting vegetables for several years, this hand-crunching was a new technique for me. Now I use it all the time. One of the oldest forms of food preservation, salt fermentation is also one of the safest. When fermenting cabbage into kraut, making salt-brined pickles, or turning radishes and Chinese cabbage into kimchi, high salt levels in the liquid, called brine, limit the growth of unwanted micro-organisms. At the same time, controlled salt allows certain strains of bacteria, primarily those called lactobacilli, to flourish. Using sugars in the raw food for energy, the lactobacilli produce lactic acids, which further protect the food from spoilage while imparting a tangy flavour. Once a fermented food has soured (gone tangy), it can be repacked into clean jars and stored in the refrigerator for at least four to five months, assuming there is any left. This is doubtful, because fermented vegetables are so delicious and nutritious that they become the go-to food when you want a fat free, vitamin-rich, probiotic snack. Use only fresh, flawless produce that has been thoroughly cleaned. Use clean hands, knives and chopping surfaces when preparing produce for fermentation. Use an appropriate amount of salt, which can be difficult to measure until you get the hang of things. In general, the goal is to use about two tablespoons (34 gm) of non-iodized salt per quart of volume. Exact measurements are challenging, because veggies give off their juices when placed in a salt solution. When tasted on the second day, after juices from the fermenting vegetables have joined the water and salt, the veggies should taste slightly saltier than you would want to eat them, or slightly less salty than sea water, which averages 3.5 percent. If the brine tastes too salty on the third day, it's fine to pour much of it out and replace it with fresh water. Re-taste after 12 hours or so, and further dilute if it is not in the edible range. Yes, you are losing some probiotics when you pour off a too-salty brine, but ignoring the situation will slow fermentation and favour out-of-the-mainstream microbes. For flavour and the success of your fermenting vegetables, get the salt in the acceptable range by day four. Autumn is generally the best season for fermenting vegetables, which is best done in cool weather. The fermentation process itself generates a few degrees of heat, so room temperatures above 75°F (24°C) degrees can push the temperature of a fermentation project above 80°F (27°C) degrees. Veggies that ferment under warm conditions tend to go soft and slimy; under cooler temps (60°-70°/15°-20°C), they stay crisp. Glass canning jars are ideal for making small batches of fermented vegetables. In alphabetical order, the best vegetables for fermenting include cabbage, carrots, cauliflower, cucumbers, garlic, kohlrabi, peppers, radishes, French beans and turnips. Whole pickling cucumbers are normally fermented on their own, in a large crock, but the other veggies on the list can easily be fermented in glass jars, solo or in mixtures. To start a batch, chop or slice vegetables into bite-size pieces, and place in a large bowl or pan. Sprinkle with salt, and massage the salt into the veggies for at least five minutes. Feel free to add spices for colour and flavour, including chilli powder, ginger, turmeric, and caraway or fennel seeds. Place the vegetables in a wide-mouth glass jar, and press down with your fingers. Leave at least two inches (5 cm) between the salted veggies and the top of the jar. Next, fill a plastic sandwich bag with cool water, rinse to make sure it's clean, and stuff it into the top of the jar. The water-filled bag serves as a weight and an airlock. As fermentation progresses, gases will "burp" along the edges of the plastic bag, and you will want to catch any liquid with a plate. The next day, stir a bit with a clean spoon, and add a small amount of filtered water if needed to completely cover the fermenting vegetables with liquid. Then press down the veggies and replace the water-filled sandwich bag. Repeat this drill daily, and don't worry about funky smells, especially when fermenting cabbage or radishes. Days three to six tend to be quite aromatic, though the water-bag method goes a long way toward minimising fermentation odors. After five days, start tasting the fermenting vegetables to see how you like them. Refrigeration will bring fermentation to a standstill, but you don't want to stop fermentation too soon. Three days in, the flavour of the food may have begun to change, but the fermentation process should go longer, to the "tangy-sour" stage, in order for the food to be properly preserved for long-term storage in the fridge. This may take three weeks in a cool basement, or only five to seven days in a typical kitchen. "Do you have to chop cabbage? Not too long ago a medical technician told me she ferments her cabbage leaves and uses them for making stuffed cabbage. Although Polish by marriage, I make a very good (MILs recipe) stuffed cabbage but never heard of fermenting the cabbage for rolls. This technician, was born and raised in Poland and so she knows Old World ways; so - are whole leaves recommended?" "Charlene, experienced fermenters like Sandor Katz keep a crock in the basement and continuously add things to it, including whole cabbages and turnips. I have never had enough cabbage to try it, but some sources say to pack several cabbages into a crock tightly, and cover them with salt brine. Personally, I blanch the nice wrapper leaves from the outside of cabbage heads, and freeze them flat. When thawed they are great for stuffed cabbage. " 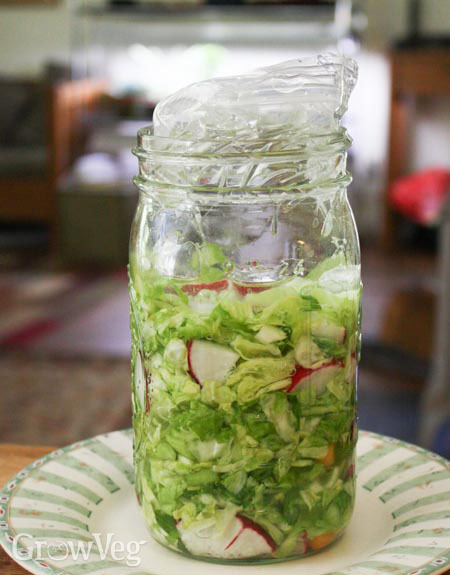 "I had been trying to find a simple, inexpensive way to ferment veggies and this is it. What a great idea using a sandwich bag for keeping the veggies under the water level! Thank you!"